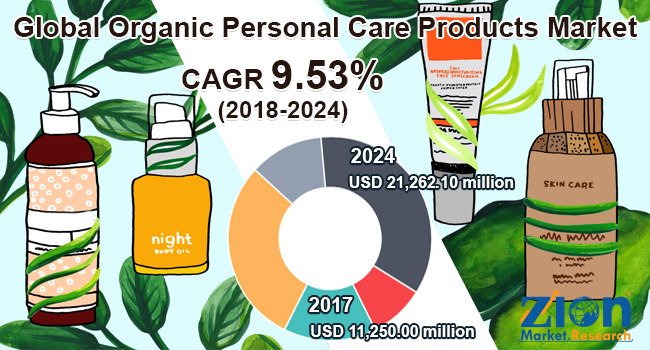 Global organic personal care products market expected to reach approximately USD 21,262.10 million by 2024, growing at a CAGR of around 9.53% between 2018 and 2024. The rise in use of organic skin care products over synthetic products may help in the growth of organic personal care products industry. The report covers forecast and analysis for the organic personal care products market on a global and regional level. The study provides historical data along with a forecast from 2018 to 2024 based on revenue (USD Million) and volume (Million Units). The study includes drivers and restraints for the organic personal care products market along with the impact they have on the demand over the forecast period. Additionally, the report includes the study of opportunities and threats to organic personal care products market on a global level. To understand the competitive landscape in the market, an analysis of Porter’s Five Forces model for the organic personal care products market has also been included. The study encompasses a market attractiveness analysis, wherein type segments and distribution channel segments are benchmarked based on their market size, growth rate, and general attractiveness. The study provides a decisive view of the organic personal care products market by segmenting the market based on product category, distribution channel, and regions. All the segments have been analyzed based on present and future trends and the market is estimated from 2018 to 2024. Based on the product category, the global organic personal care products market is segmented into skin care, hair care, oral care, color cosmetics, and others. Based on the distribution channel, the organic personal care products market is segmented into a hypermarket/supermarket, specialist retailers, drug stores, online retailing, and direct selling. The regional segmentation includes the current and forecast demand for North America, Europe, Asia Pacific, Latin America, and the Middle East and Africa with its further bifurcation into major countries including the U.S., Germany, France, the UK, China, Japan, India, and Brazil. The report include detailed profiles including company overview, key developments, business strategies, financial overview, etc. of key players operating in the global organic personal care products market such as Hain Celestial Group, Estee Lauder, Yves Rocher,The Body Shop, Bare Escentuals, Burt’s Bee, Arbonne International, L’Oreal, Aveda Corp, Amway, L'Occitane en Provence, and Natura Cosméticos S.A.